We practically live in a box called apartment, such is the constraint of space in most big cities of the world. One look around and all you'll see are lofty cemented towers or dusty construction sites. Amidst the dust, grime and lifeless surroundings, it's good to crop up something 'green'. Not many have the luxury of a lawn facing cottage or a bungalow with a private garden at the back. However, that should not be a reason to avert the idea of growing some greens in your humble little apartment. Surf through your home carefully - the window next to your kitchen sink, the balcony, the corners of your living room, and the terrace (if you have one), all of these serve to be ideal places for your urban garden. For Mumbai based multi-disciplinary design consultant, Shweta Kaushik, cacti and succulents make for ideal house plants. "If you are looking for hassle free no nonsense green within your household, cacti and succulents are your best option. They do not need to be watered that often as their natural tendency is to survive in harsh conditions. You can leave them out on your balcony or a window sill and pretty much forget about them until you remember you were trying to cultivate a green thumb. I have personally grown some Aloe Vera, and if you have the right conditions, it even blooms!" she says. 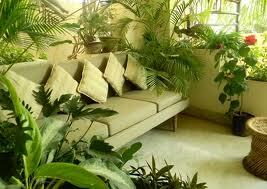 Another kind of container plant that features in her list of apartment greens is tropical palms. She says, "They are very easy to maintain and do not die on you unless you ignore them for too long. They come in a variety of sizes and will be easily available at your local nursery. They can grow up to 4 feet in height and look quite elegant when placed in the balcony." Besides this, people with culinary inclinations can try growing herbs. "Herbs aren't difficult to maintain at all and the thought of plucking fresh leaves from your makeshift garden while cooking can be quite exciting," adds Shweta. Lemongrass: When you buy a stalk of lemongrass at your local market, pick a stem that has a firm base. Simply, trim the top of the herb and place it water. Don't submerge it; just ensure that the base is 2-3 inches deep in water. The stalk will start producing roots and news shoots in a few days. Mint: Out of spearmint and peppermint, the latter is an easier option when it comes to growing herbs in an apartment because this herb has a tendency to grow like a weed. Spread the peppermint seeds in a small pot full of soil and keep it in the shade but near the sun. Curry leaf: A flavoursome herb with beautiful aroma, curry leaves are found in most South Indian homes. Plant the sapling in a flower pot and support it with a stick as it will grow vertically and would need some support. Make sure it gets enough sunlight and water it at least once a day. Parsley: Simply spread the seeds in a pot full of soil and wait for the seeds to germinate. Parsley grows very slowly and it may take 2-3 weeks for the herb to grow fully. Place it in an airy, shady corner. Rosemary: Rosemary doesn't need to be watered frequently and therefore can be easily maintained in an apartment. Out of the many varieties of the herb, it's wise to pick the one that grows upright, making it easier for you to care for it in compact spaces. Indian Basil: Almost all Indian homes will have the Indian basil ( tulsi) in their homes. The herb requires very little care and grows well if placed near the windows. Ensure that the soil remains moist always.